I recently returned from a trip to Japan. It's a fascinating culture to say the least and what tickled my eco heart most was the opportunity to observe an eastern country's environmental efforts first hand. Here's a taste of what I found. 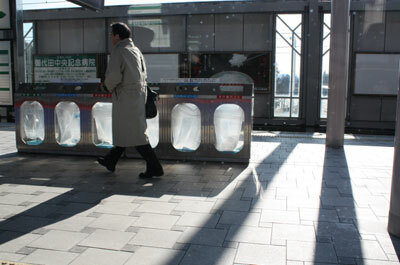 Recycling bins were everywhere and the Japanese are keen to oblige. Both in the country and cities, Tokyo in particular, the streets are impeccably clean which is impressive considering a staggering 12 million or so dwell in the never ending inner city suburbs of the capital. 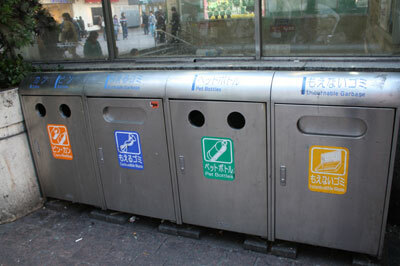 Most Japanese people use public transport or cycle. The cycling system is brilliant - cyclists ride on pathways that are divided and shared with pedestrians. London in comparison has fewer cycle ways but we do have more bike racks to lock our cycles up. That might be because no one locks their bike up in Japan. No one. Not a single lock or helmet to be seen. This doesn't feel like such a crazy concept when you're in the middle of this heaving yet curiously placid city - the traffic is relatively calm and the people more interested in keeping the peace than nicking your stuff. Travelling by bike makes sense. Few tourists can afford to catch taxis (at £20 for a few blocks) and a day pass on the metro is no cheaper than London (around £8) so it makes sense to bike it.